Don’t call it a comeback. Following a brief stint in the Nokia's mothership, Withings is back and packing heat in the form of the Withings Steel HR Sport. Earlier this year, Nokia dispensed with the health tech company it acquired in 2016, sending it back into the arms of co-founder Eric Carreel. It was a quick turnaround for the French startup, which had only just rebranded its devices with the Nokia name. Now that the Withings brand has been reinstated, it’s back to business as usual, starting with the Steel HR Sport. If that name sounds familiar, that's because Withings already had a watch called the Withings Steel HR, which was rebranded as the Nokia Steel HR after the short-lived buyout. The Sport is a recognizable member of the same family, but crams in more this time around: connected GPS and VO2 Max tracking make this a more adept running companion. But a lot has changed since Withings was last on the scene, so is its sporty new wearable worthy of a place in the top echelons? Or is it falling behind? Here’s our full review. 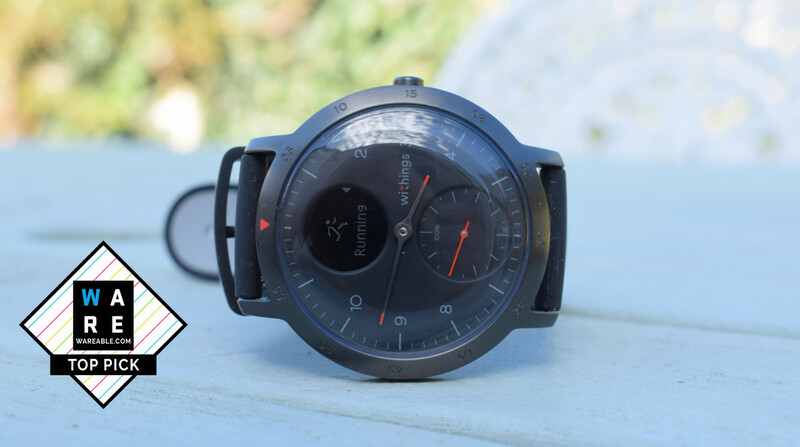 The name might be stamped on the face, but this is otherwise recognizably a Withings watch. In fact, ever since the Activite Pop in 2014, Withings has been making some of the best looking wearables on the market. This time the watch only comes in one 40mm size, one matte black metal case, with an option of white or black watch face, but it's very similar to the Nokia Steel HR. I’ve been using the black version, and like the Steel HR before it, it still feels versatile enough to match any outfit, whether that's a suit or my gym kit. While you only have one choice in size, it feels small enough to appeal to both men and women, particularly at just 13mm thick. Meanwhile the 20mm silicone sports band is now perforated, making it nice and breathable for running, but there's also a leather one for when it is time to slip on that aforementioned suit. If none of Withings’ options speak to you, just use one of your own 40mm straps - they'll fit. On the face there’s still a small monochrome OLED screen to show your widgets and a button on the right side for scrolling through them. The bottom sub-dial is back too, showing your progress towards your day’s step goal. If you can imagine what 49g feels like on your wrist, that’s what you’re dealing with; Withings still makes one of the lightest and most comfortable hybrid smartwatches we’ve worn. The Steel HR Sport is even more interested in getting you fit this time around. That means getting you off the couch and hitting those step goals, but it also means tracking individual sports and taking a deeper look at your fitness. One of the new headline features is a VO2 Max estimation, which gives you an insight into how much oxygen you’re utilizing during exercise. This is something we’ve seen filter down from sports watches to more mainstream wearables, and in the Steel HR Sport you’ll see your ‘Fitness level’ score – a number between 17 and 60 – that determines how much oxygen is being transferred to the blood during exercise. Basically, the higher the number, the better. You'll need to work out for at least 10 minutes for a session in order to get your first reading, and it will take a few runs to hone in on an accurate number. Mine started at 55, but it’s changed ever so slightly since. However, take these numbers as estimates rather than gospel: VO2 Max requires lab conditions and all sorts of complex apparatus for an accurate reading. The Steel HR Sport also has connected GPS, meaning you can track your route but only when your phone is paired. It's something we've seen Fitbit do with its devices, and although built-in GPS is more desirable, this isn't otherwise a running watch built for standalone use; there's no built-in music, onboard payments or anything similar. Once you start a run, you can see your pace, distance and heart rate on the watch itself, and you'll be able to view your route in the app afterwards. The watch and phone are pretty good at talking to each other here: start a workout from the watch and as long as your phone is in Bluetooth range, the Health Mate app will pop up showing your time, distance, pace, current heart rate, and your heart rate zone. Afterwards you’ll also see your pace, elevation and altitude gain, but again a lot of this is being processed by the phone, not the watch. Sadly you can’t adjust heart rate zones, and really, all of this is as far as workout tracking goes on the Steel HR Sport. Any running enthusiasts with an eye on Withings’ latest wearable may be better looking in Garmin’s or Polar's directions instead. As for accuracy, the experience has been as good, if not better, than the Nokia Steel HR. Withings has made improvements to those sensors over time, and even with some interval training it managed to keep in line. That said, the live readout was definitely trailing behind the Polar H10 chest strap, although this seemed to have corrected itself in the graphs. The final result was exceptionally close; the Steel HR Sport can keep up. The Withings Steel HR Sport can track your sleep too, analyzing your different “stages” - awake, light and deep sleep - and giving you a look at how your heart rate varies through the night. Unless you’re someone who hates wearing anything on their wrist to bed, Steel HR Sport’s slender physique makes it comfortable to wear to sleep. There’s an alarm too, so you can be woken by a gentle vibration on your wrist rather than a blaring alarm clock. It’s actually pretty nice. Accuracy is good but not at the level Fitbit is performing these days. On most days it was 5-10 minutes late at detecting my wake-up time. Apparently those few minutes spent trying to will myself out of bed weren’t enough to tell my watch I was awake. Light and deep sleep tracking is done through a combination of movement and heart rate detection, but if you’re not sure how much of each you should be getting, you can delve into the specifics in the app. You also get an overall ‘Sleep Score’, so you have an idea of whether you’re improving or not. As well as sleep and workouts, the Health Mate app offers a variety of programs, some of which let you plug in other Withings devices, such as scales, to monitor your progress. Withings CEO Eric Carreel told me that previous devices will continue to be supported with updates, whether they have the Nokia or the Withings name emblazoned on them. That small, circular display can also display notifications, and this stretches to all your third-party apps. Messages and other notifications will scroll along the notification window, preceded by a small vibration. The watch displays the contents of the notification too, which will scroll along the screen. The problem here is that the sub-dial display can’t show very much text at once, so depending on the length of the message you might be holding your wrist up for quite a while to read it all. Notifications disappear after a couple of cycles through the screen and they don’t stack like they do on the Apple Watch either, so you really have to catch them as they appear, or just reach for your smartphone. But rather than simply mirroring everything notification on your phone, the Health Mate app lets you choose which apps you want alerts for, but all of your apps can be supported. There are separate toggles for messages, calendar and incoming call alerts, for for some people these will be enough. I have these and just a couple of apps enabled, but 90% of them are silenced, else I’d find my wrist vibrating endlessly throughout the day. Withings says you can expect 25 days of battery life, same as the Nokia Steel HR, with an additional 20 days if you put it into the power reserve mode. That was proven in testing: after a couple of workouts the watch was still above 90%, and in almost three weeks of testing I only had to charge it once, due to it not being fully powered when I first put it on. When you look at what else is out there, Withings is beating a lot of competitors on battery life. And for a lot of people, that matters. With the Apple Watch Series 4 still stretching to 18 hours max, Withings is getting to almost a month. Yes, the Apple Watch does a lot more, but there are plenty of people who will forego some of those extras to not have to worry about charging their watch every night. The Withings Steel HR Sport builds on all the things we loved about its predecessors. You’ve still got the handsome look, the long battery life and the great Health Mate app. But connected GPS and VO2 Max round out the Sport to satisfy those looking for an all-day tracker with running chops - with a strong optical HR sensor to boot. Smart features are meagre next to other smartwatches, but that’s the price of having an analogue display. "Carreel says the company already has a close relationship with the FDA". What about the Pulse Wave Velocity feature on Body Cardio? Withings still prices it at US$149.95. It's sad to see it being removed.